Lace Shaping is the third set of designs and heirloom techniques from the Heirloom Embellishments series. This set includes 10 beautifully digitized designs featuring heirloom techniques, that are recreated in the embroidery hoop! Five of the designs are versions of traditional lace shaping and include a bow, double diamond, heart, scallop and corner motif. All you need is your embroidery machine, water soluble stabilizer and English cotton netting to start embroidering beautiful heirlooms today. A PDF tutorial file is included with your download which walks you through the simple techniques needed for these embroidery designs. Be sure to print this file before you begin to embroider. Click Here to see a sample page of the tutorial. These designs are in mixed sizes and some require the large hoops. Check the design sizes below before you purchase them. 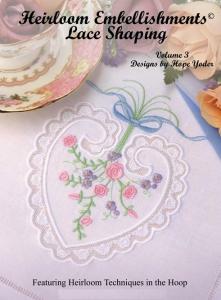 Below are the embroidery designs and the available formats included with the Lace Shaping projects. These designs are in mixed sizes and some require the large hoops. Be sure to check which designs you can use before you purchase them. Corner Flower 1.25 x 1.25"
Flower Spray 2 x 4"
Flower Spray 3 x 4"
Little Flowers 5 x 0.8"
Scallop Ovals 7 x 3"
Following are some of the stunning projects Hope has made using these beautiful lace designs. You can easily re-create these designs for yourself using Hope's easy to follow, step by step directions included with your tutorial download. 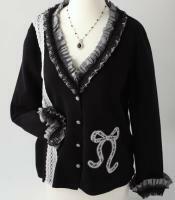 Following are examples of the designs stitched out. 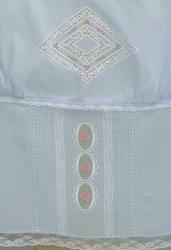 You can see a close up view of the beautiful lace techniques used. 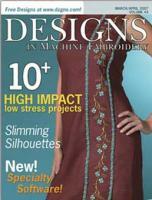 Designs in Machine Embroidery Magazine April 06 featuring Hope's designs on the front cover. Hope had an article called Digital Lace Shaping featured in this magazine that included designs from this Lace Shaping Collection. Tranform pretty linen bath towels into a designer skirt. 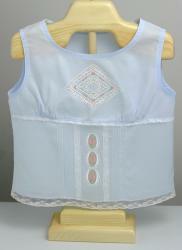 Hemline is embellished with "Scallop" designs from Hope's "Lace Shaping" embroidery collection which uses Hope's special heirloom techniques that are re-created in the embroidery hoop.